Stiga World Champs Table Soccer Game – Get Ready for Some Action! 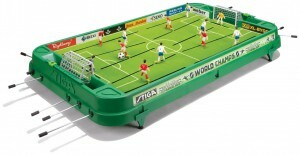 Fast and Fun Family Entertainment with the Stiga “World Champs” Table Soccer Game. Stiga has combined all the skill and fun of Foosball and Rod Hockey to achieve a realistic and challenging table game that kids of all ages can enjoy. 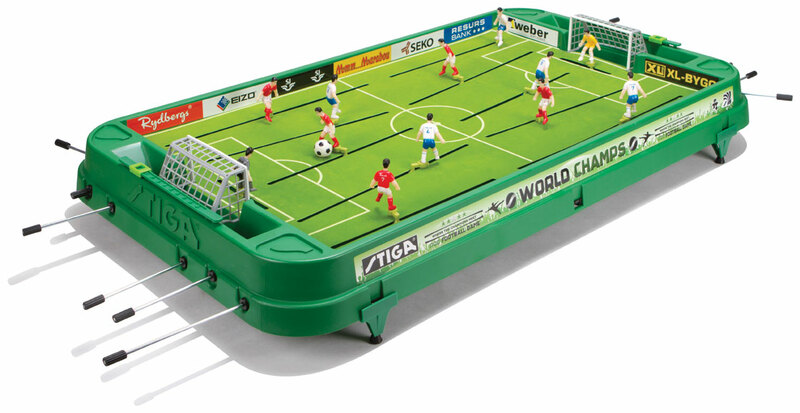 The Stiga World Champs Table Top Soccer Game boasts an improved design to enhance play! This new modern version features a new steering rod design and new ball, making the touch and feel of the game very enjoyable. The World Champs Table Soccer Game includes an excellent rod mechanism that lets you control the action the way you want with cool passing options and hard shots. All players are 3 dimensional and wear USA and Mexico colors. Players move 360 degrees and up and down the field for a maximum maneuverability and speed. Features Detailed, Painted Men to Add to the Fun! New Game Ball Improves the Playing Experience! Join the new table game revolution. Challenge your friends and family and become a champ. The Field and rods come assembled, you just need to snap on a few parts. All games sold in North America are prepacked with Team USA & Mexico. 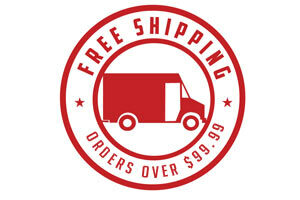 We also have a number of International teams available for purchase.